You’ve been asking for it, and now we’re ready; internal cable routing is available on BTR frames! Our own frustrations from experience of working on other manufacturers’ bikes in bike shops and at races. It’s infuriating to fiddle for hours to get a cable to come back out of a hole from inside a frame (fishing with the hooked end of a spoke), and then discover that an exposed inner gear wire is gradually sawing through the nice new brake hose. The silent killer of steel frames; rust. Water (and grit and grime) needs to stay outside the frame, where the paint can do it’s job and protect the steel. It’s not like the tiniest bit of water in the frame would dissolve it – water gets in past the seat post etc anyhow. All your frame needs is a bit of routine maintenance to ensure it lasts for many years. We certainly weren’t comfortable with accelerating the rate of decay of your hard-earned frame by turning your seat tube into a hydration pack, though. The frame has to still be strong and durable enough once there are enough holes in it for cables to enter and exit. This one is the most difficult, because we have to consider long-term fatigue life as well as those big hucks-to-flat. Number one is simple; the cables have to be totally guided through the frame to make sure they can’t get caught up with each other. Small, thin steel tubes will do this just fine. For the cables which enter the frame, and then reappear out into daylight, number two followed straight on from number one; just make the guide tubes stainless. That way any gubbins that gets into the guide tube around the cable will just run out the other end without getting the important bits moist. Problems here arise when the cable needs to re-emerge inside the frame, like for a stealth dropper seat post. Other manufacturers have their own way of getting around this, normally some form of push-in rubber grommet around the cable where it enters the frame. But this always looks like a bit of a bandage solution to me, and I’m sure that with the wiggling the cables go through in normal use, some water would make it’s way into the frame and begin its nasty business. The solution we came up with for number two is gloriously simple; extend the internal guide tubes by 10mm, and slip a 20mm section of rubber hose over the end of the guide, and over the cable. This offers plenty of flexibility to cope with cable movement, and it’s super tidy. Plus, in a pinch you could easily just wrap the cable and guide tube with electrical or duck tape – no worries! Number three took some FEA analysis, some discussion with tubing manufacturers, and a lot of head-scratching. We started with just considering outright strength; we needed to find the point to route the cables through the frame tubes where they’d hinder the structure the least. Now, in order to get the cable to the bottom end of the dropper, we needed to go into the down tube…makes sense to route the rear brake and derailleur cables through there too if we can. A ‘quick’ look at a few FEA scenarios highlighted the best positions; the side lines at the front of the down tube, and at the BB end the cables could materialise safely just in front of the BB itself, just away from the center of the down tube. Happily, the section of the down tube overlapped by the seat tube is safe too, so the dropper cable can pop out in there without fuss. Having chosen the entry and exit locations, we just needed to be sure that everything was going to hold up to the strain. The guide tubes would have to be held in somehow, and this process was likely going to involve heat (welding of some description). 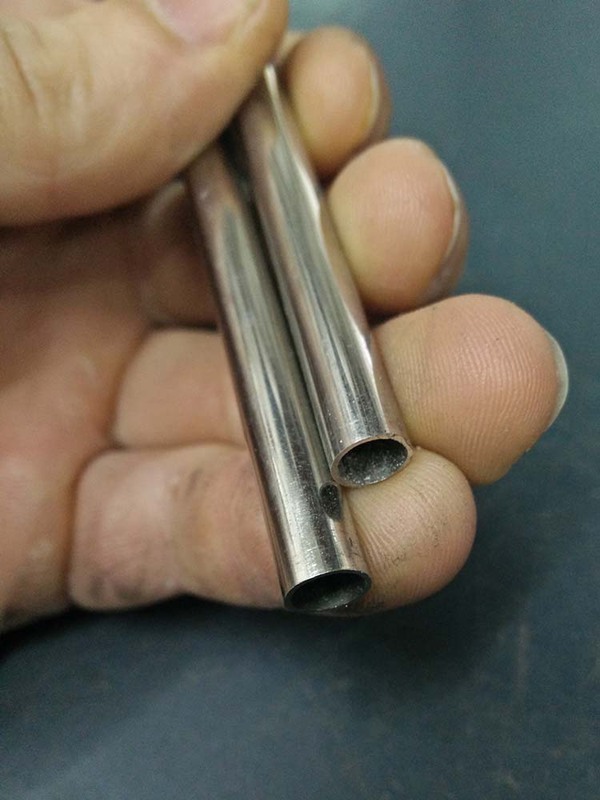 TIG welding would secure the guide tubes themselves most strongly, but would also involve creating a harsh Heat Affected Zone (HAZ) in the down tube – not brilliant. We settled on silver-brazing the guide tubes in; this method requires vastly lower temperatures than TIG welding, resulting in a much less affected (though slightly larger) HAZ. Silver would also be plenty strong enough to keep the guide tubes from breaking away, and the neat little concave fillets Burf is able to sculpt helps to dissipate the stresses around the edge of the hole in the down tube. Poring over Reynolds literature on HAZ strength, as well as a few questions to their technical guru, we came up with a maximum stress figure that we’d accept around the internal cable routing entry and exit points. This is a value which needed to be below the material’s yield stress in the HAZ for the toughest loading scenarios, and below another (lower) stress for us to be confident of fatigue life. So all three problems conquered, success…but there’s still more! We know what we’re aiming for now, but we can’t just be attacking the down tube with any old drill and file, and stainless guide tubing can’t just be bent around your knee (or head), so we had some tools to make! I do like making tools (when they work), and although they almost always look gnarly, they don’t get to stick around unless they do their job properly. The new BTR Internal Routing Drill (B.I.R.D.) and BTR Internal Guide Tube Impressive Manipulator Equipment (B.I.G.T.I.M.E.) are fairly typical creations, being both impressively ugly and properly effective. We haven’t gone so far as to route cables through the whole frame just yet – this adds a lot of awkwardness (AKA time, cost, and swear words) to the build process. Right now, the cables run into the down tube near the head tube, and pop out just in front of the BB, and inside the base of the seat tube. It’s worth noting, if you’re fitting a Reverb Stealth, that RockShox supply a little widget for coupling the end of an outer gear cable to the end of the hydraulic dropper hose (or any other hose you might need). This allows you to insert the gear outer through the frame and use it to draw the dropper cable through the guide tube. Nice one RS. The brake and gear cables can be inserted easily from either end – just remember to put the sections of rubber tube over the outer guide tube before the cable gets there for all three; it makes getting the rubber over your cable (ahem) a lot easier.